Douglas Park Golf Club was formed in 1897 with Willie Fernie, the Troon professional and recent Open champion, designing the inaugural 9-hole course. Six years later, when the club leased a further fifty-two acres of Boclair Farm, Fernie again advised on the extension of the course to an 18-hole layout. This new course lasted only a few years before another 17.5-acre tract was secured on the other side of the adjoining cemetery, allowing four new holes to be brought into play. In 1933, after acquiring another small parcel of land, further modifications were made to the course, resulting in the introduction of a new par three 3rd hole and a right doglegged 4th hole. Holes 10 and 11 were combined to form a new par four 11th hole, which then played to the vacated 3rd green. The 12th tee was also moved at this time to the old 3rd tee, creating an intimidating short par four that was played through a chute of trees and bushes. 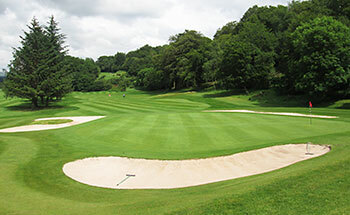 The most recent significant alterations to the course occurred in 1972 when a number of changes were implemented: the 2nd green was repositioned further away from the railway tracks, the line to the par three 3rd was altered by 90 degrees, the green to the 11th hole was moved back a hundred yards and the 12th hole was changed to a very short, uphill par three. The course measured a shade less than 6,000 yards after all the modifications were made and it’s remained more or less that length right up to the present day. The Antonine Wall, a stone and turf fortification built by the Romans across the Central Belt of Scotland around AD 142, runs through part of the course, across land that was originally leased from farmer Russell of Boclair Farm in 1906. The route of the wall takes it along the left side of the uphill par three 15th then along the ridge to the 13th green (at the highest point on the property) before continuing on eastwards towards Summerston. Douglas Park in Bearsden is a fine parkland track, laid out on a nicely undulating drumlin landscape. One or two quirky little holes – the 110-yard blind uphill 12th, for instance – help to sustain interest all the way round. The two-tier greens at the 2nd and 4th promise good things to come in terms of exciting putting surface contours but, sadly, the next (and final) hole to exhibit such an engaging split level is at the 18th! I’m not a fan of long par threes so the 240-yard 5th is not a favourite of mine, even if it is downhill all the way from tee to green. There’s a couple of punishing long par fours to end the front nine; the 8th plays uphill and normally into the prevailing wind whilst a burns crosses the front of the fairway at the downhill 9th. A good score at each of these two holes is virtually essential for golfers wanting to accumulate a decent stableford points total. The back nine features another long par three at the 15th (which is even worse than the 5th as this one plays uphill) but it’s balanced by a terrific short par three two holes later, where the tee shot calls for a heroic carry across a gully to a pulpit green. The round finishes with a flourish from an elevated tee position in the trees on the short par four last hole, down to a wide fairway that leads to a large, well-bunkered home green - a satisfying par or better is always a nice way to end things at Douglas Park!